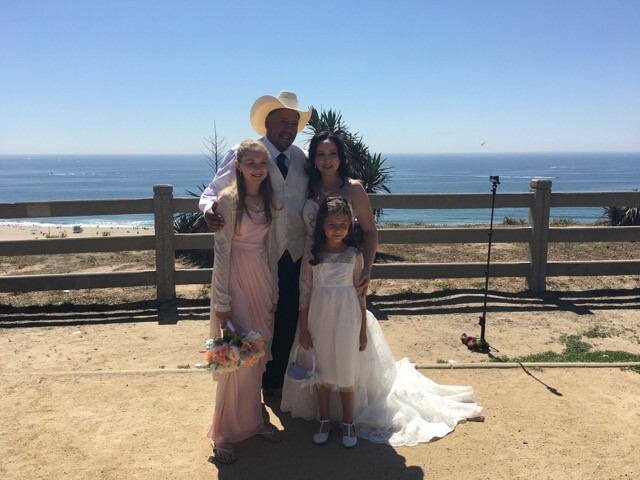 It was a typical gorgeous day at Palasides Park that was made even more beautiful by the love that was reaffirmed in the vow renewal for Charles (Kat) and Wanda Edgerton. 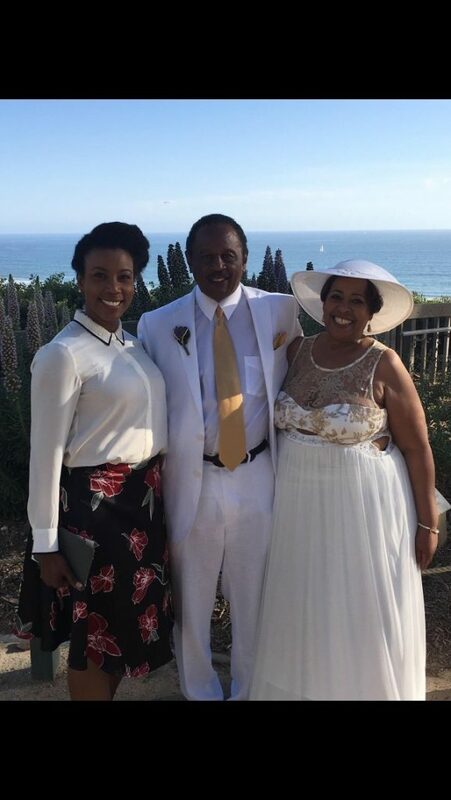 After 50 years of marriage they renewed their vows in front of their children and grandchildren in an all-white affair. The love and affection this family has for each other was so infectious that it captured the attention of passers-by who became impromptu wedding guests. Congratulations Kat and Wanda. 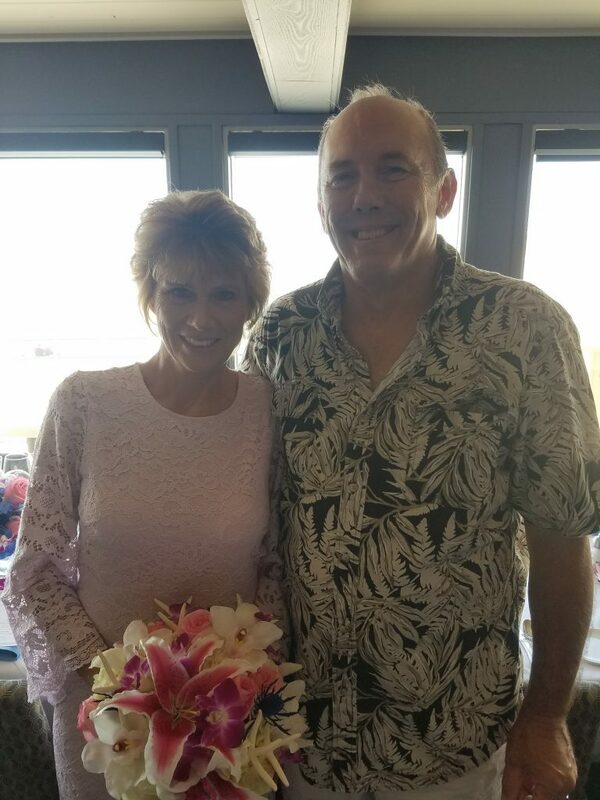 May your next 50 years together be even more blessed and amazing. 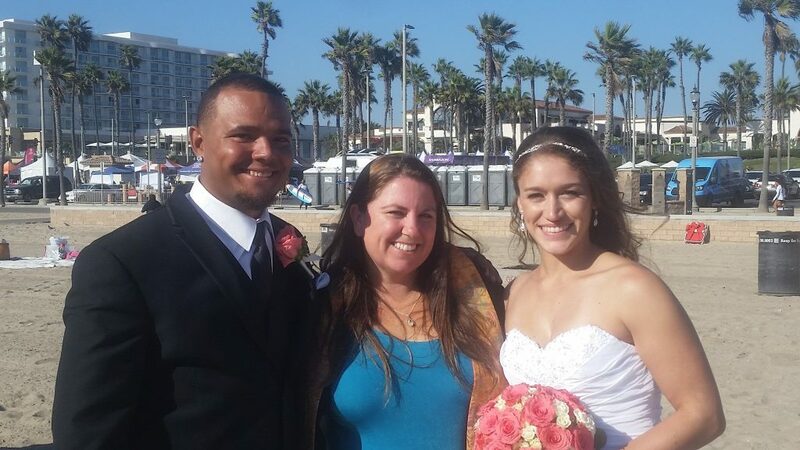 Art & Lizbeth celebrated their wedding at Miramar Park. in Redondo Beach. 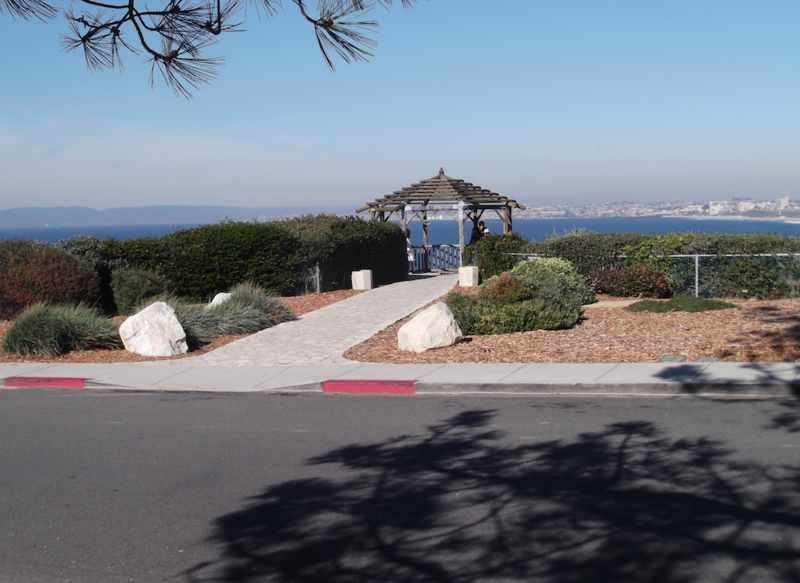 Art & Lizbeth celebrated their wedding at Miramar Park. in Redondo Beach. Great Couple. They stared at each other smiling throughout the ceremony and had a great sense of humor. Excellent location. Best ocean view and mild ocean breeze. The weather could had not been better. We can do set ups for up to 100 guests at this location. We set up the chairs, arch, handle all the permits and insurance. all the couple has to do is walk down the aisle! 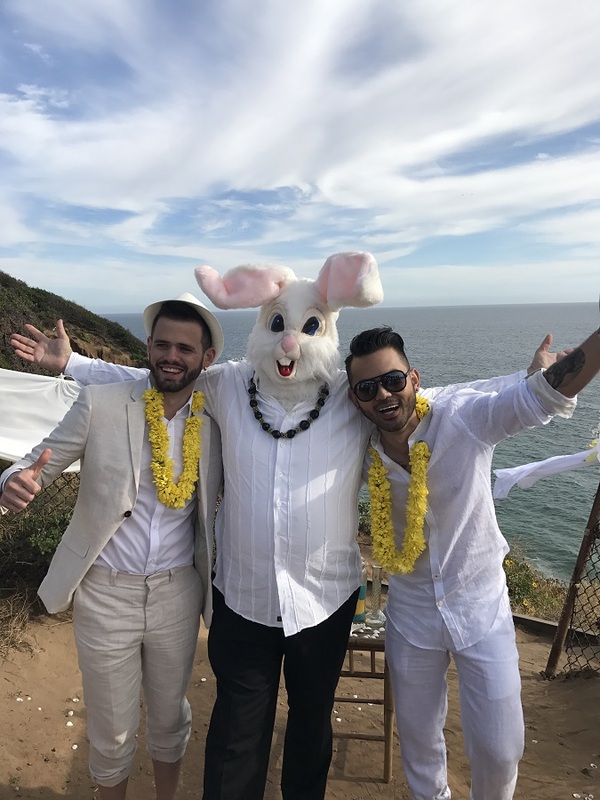 Joey and Gustavo wanted to get married on Easter Sunday so i dad to bring along my bunny head. I didn’t wear it for the ceremony only for pictures after. It made for a great laugh. 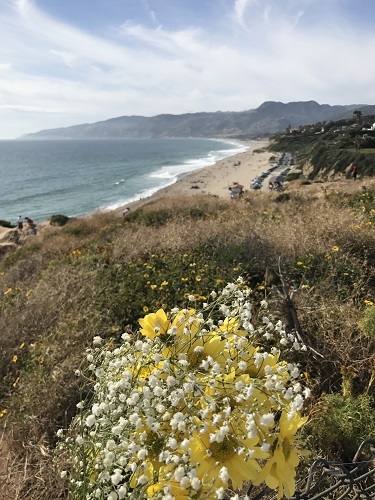 They chose Point Dume in Malibu. 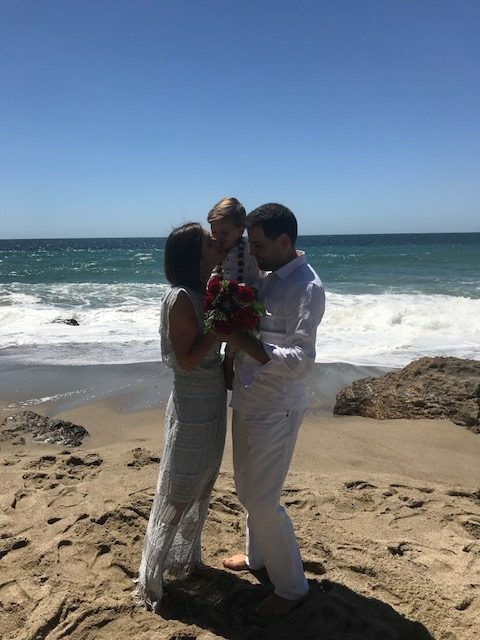 I was all ready to walk out onto the beach when their friend pointed to the top of the cliffs and said the wedding is up there. I was not ready for that as I was ready to be barefoot on the beach. SO I put on my dress shoes and trecked up the hill. They decorated the area with wild flowers and draping and the grooms walked down the gauntlet of friends to the end of the path to where I was waiting. 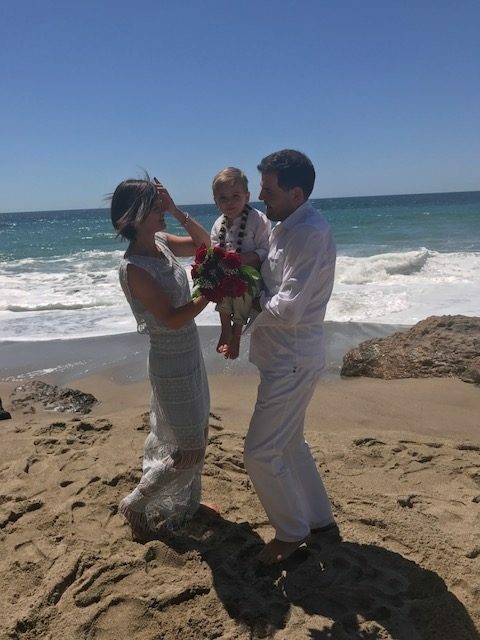 They did a beautiful Sand Ceremony blending their lives together. After it was all done they had a big kiss and got tons of pictures with their family and friends. 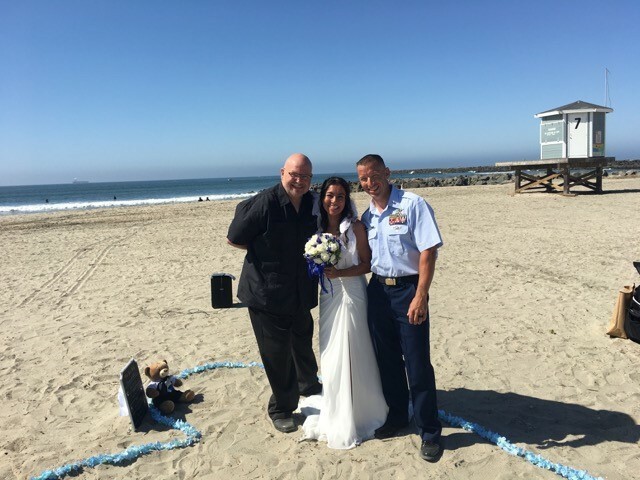 Roger had the extreme honor to marry Adam & Diserie this last Sunday at 10:00 in the morning in Seal Beach……. And they made it just in time. No, they weren’t late….in fact early….. And all their guest were there on time too…….. It was just the fact that most of their guests and Adam & Diserie had run a triathlon THE DAY BEFORE !! But you would never know it ! Both were chipper and excited to start the day ! It was a great day and a wonderful couple ! Some couples will exchange gifts during the ceremony and some couples will read their worlds of love to one another…….. 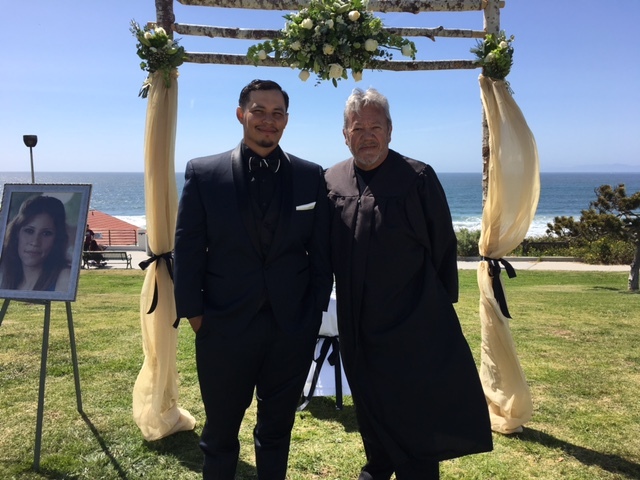 This last Saturday Roger got to witness a very special gift that was given to the groom Alfredo from his bride Julianne…..and Roger got to be part of it. 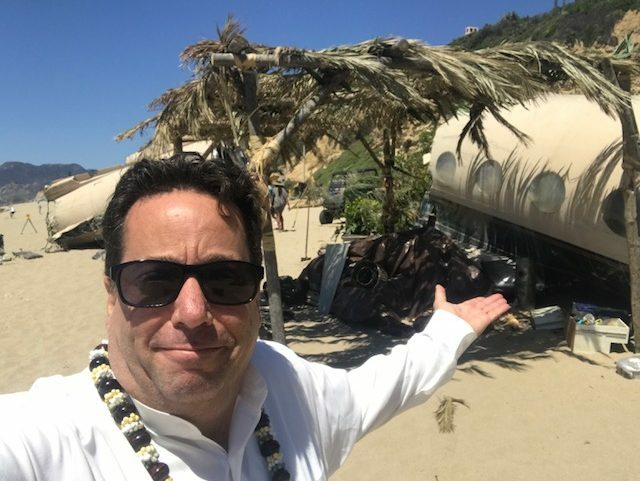 The wedding was held at the always wonderful Palisades Park in Santa Monica. Just a small intimate wedding of 25 people including Julianne’s two children. Plus Julianne is pregnant with their first child together. And neither of them know the gender of the baby…. At least that is what Alfredo thought….. So just before Roger announces them husband and wife…. he mentions that Julianne has a gift for him…….. What could it be??? She hands him a small box……. And in that box was a very, teeny tiny pair of PINK cowboy boots !! Alfredo was now a father to a little girl….for a total of three girls now ! It was a wonderful surprise and a doozy of a gift !! Normally you don’t hear both of those words in the same sentence but today was a special day. They came here from Australia with their child to get married on the beach. We met in the parking lot first were issued them their marriage license and we proceeded to walk to the beach. 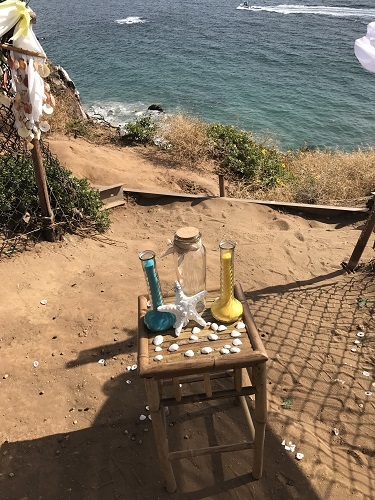 While on the beach at Point Dume in Malibu as we were walking toward the beach we noticed something strange in the sand. 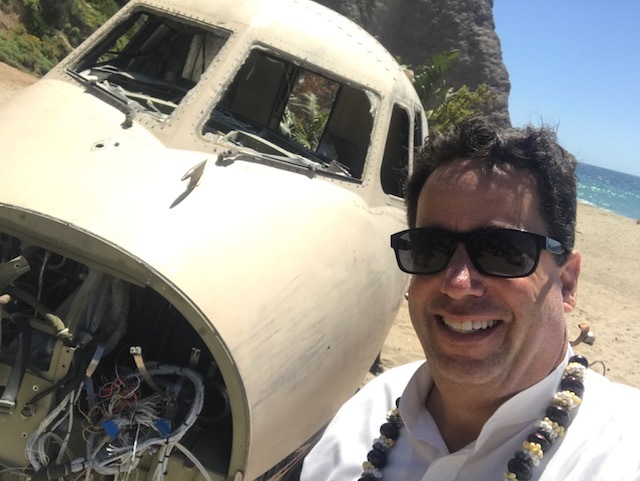 This area is well known for shooting movies and apparently they were shooting a movie about a plane crash. So after we explored a bit we went down to the waters edge by the rocks. 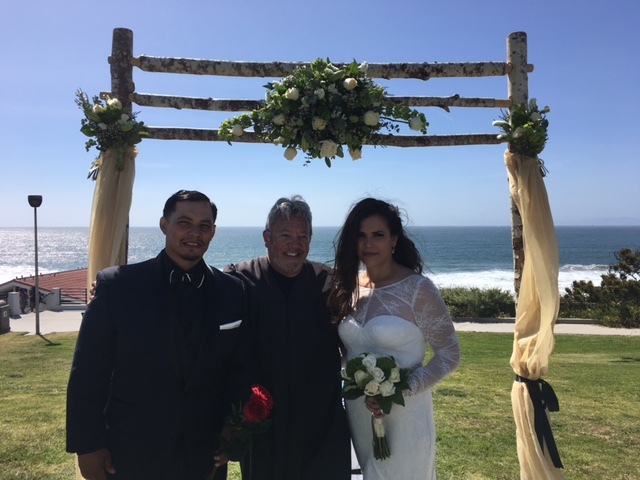 I performed a beautiful ceremony for them with the waves crashing in the background. During the ceremony a helicopter flew over and thankfully it didn’t crash. During their big kiss their child jumped up to join them. It was a very sweet moment. 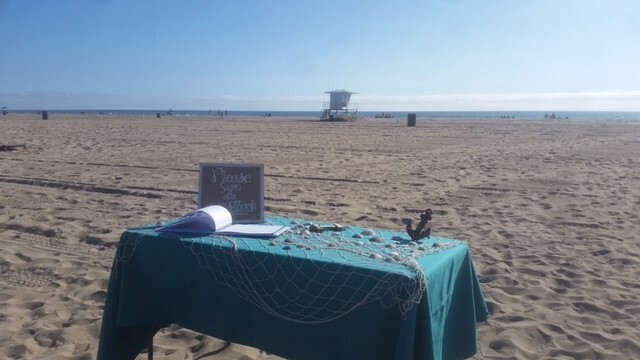 We love doing beach weddings! There were only four of us there, but it was a joyous occasion as I (Rev. Ralph) married Justin & Julia in the presence of God and photographer McKenzie Smith (mckenziesmithphotography.com) at the Roessler Point Gazebo, Malaga Cove, in beautiful Palos Verdes. It rained the day before and the day after, but was clear and calm for the quiet ceremony by the sea. 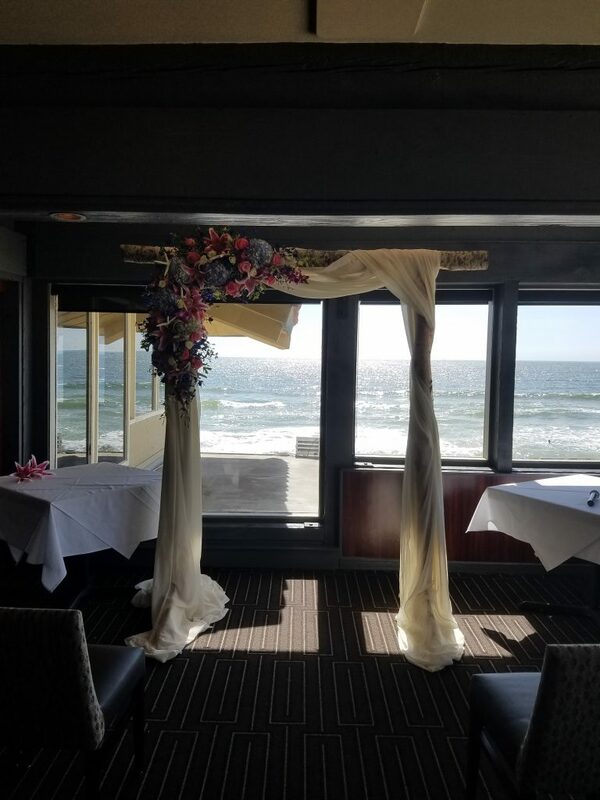 On a sunny Saturday in October, a beautiful bride surrounded by her lovely maids, stood in the sand as the breeze gently blew her hair and rippled her dress, while she awaited the arrival of her groom so she could walk down the aisle to start their lives together in Huntington Beach. There under the blue, blue sky with the deep vast ocean behind them and the warm sand at their feet, they promised to journey together through the ups and downs of life’s roller coaster, to walk hand in hand, and choose to love daily. 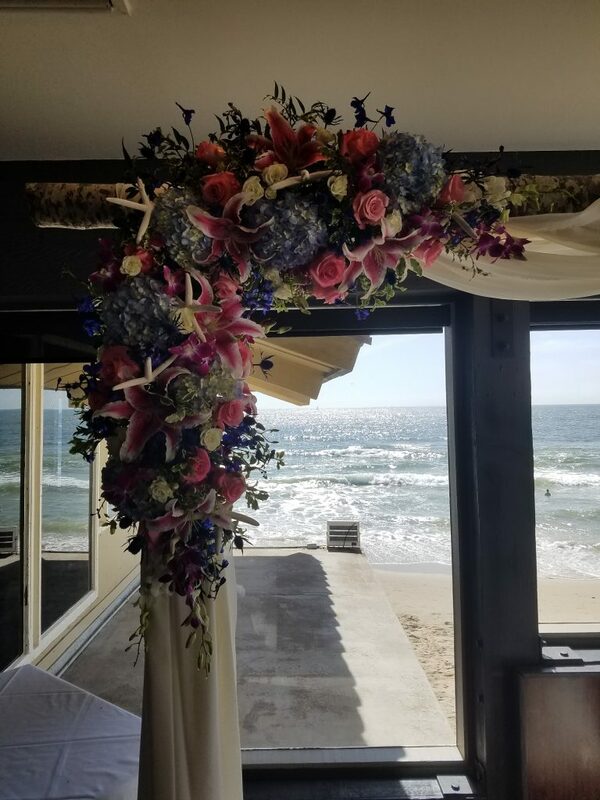 The turquoise blues and the bright coral complemented nature’s magnificent colors, paired with the arch and flowers made a picturesque setting. October’s warm weather made for an extended summer wedding that was perfect for Brianna and Melvin. Of course, nothing compared to the way Melvin looked at her, both misty eyed, as they said their vows to one another. 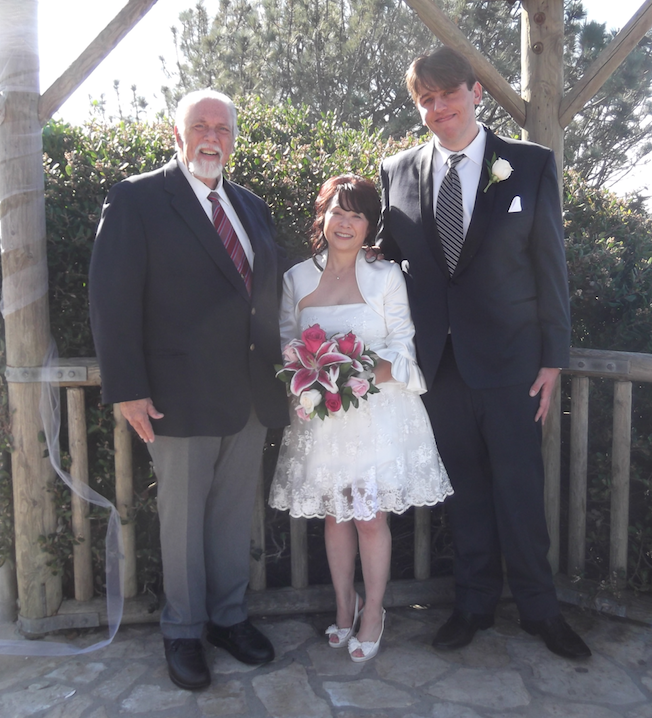 It was a lovely wedding, filled with the hope of the bride and groom’s love, and that of their family and friends that surrounded them with love and well wishes. Happy Wedding Brianna and Melvin! In a bayside ceremony led by Rev. 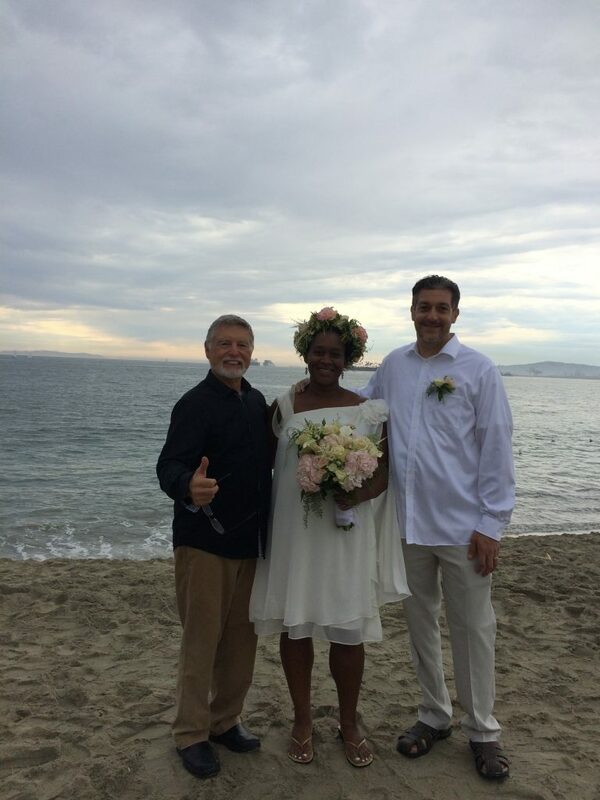 Dr. Gary Barmore, Kristi and Amir pledged their eternal love and faithful commitment in marriage. They composed their own vows, expressed before God and a few cherished guests. 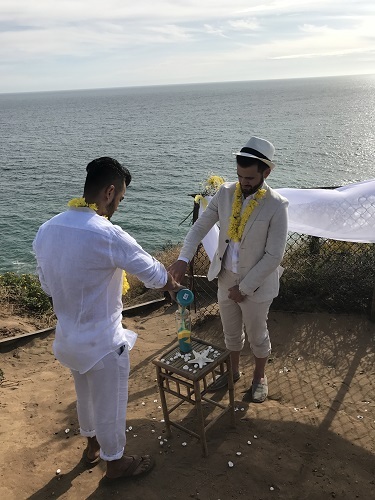 Great Officiants suggested their minister as well as the venue — a lovely spot at the end of the Belmont Shore peninsula in Long Beach. The few rain-drops that fell on this late October nuptial felt like the very kiss of God’s blessing.